In addition to enough terrain to entertain everyone in the group, today’s ski vacation checklist still includes amenities such as access to excellent spas, world-class dining, beautifully appointed accommodations, cold craft beers, a lively après scene, family friendly activities and boutique shopping. But seriously, Vegas has all of those things. So what distinguishes one ski resort from the next? Ski town culture. And in a ski town, the lifeblood of that culture flows from its mountains. 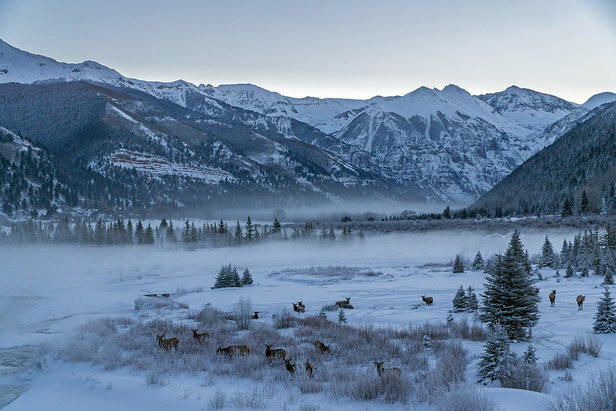 In Telluride, that pulse is dictated from the rugged San Juans. When you enter Telluride, you enter a different time and space altogether. You enter a box canyon as far from I-70 as one can imagine, so that if you wake up on a powder day, you’ll never have to worry about traffic, road closures or parking. Instead, you’ll walk to the lift, distracted by the beauty of the peaks that surround you, not the line of cars in front of you. Your biggest concern will be whether to stop on the way at The Butcher and Baker for a chocolate croissant or at Baked In Telluride for a chocolate doughnut. The Valley Floor is the gateway to Telluride and is dedicated open space with Nordic and fat tire bike trails. In Telluride we’ve got the rest covered so you can focus on what you came for—skiing. 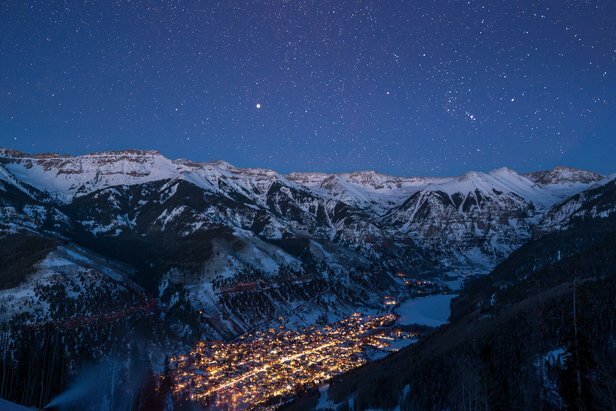 If what you want is the real deal when it comes to the ultimate ski town experience, as you plan for this winter’s ski vacation, consider these top five reasons to come to Telluride. Telluride’s beauty is unparalleled, period. After growing up in Telluride, my mom took me to Chamonix, France and Verbier, Switzerland and I thought they were just OK. When friends who grew up in Aspen and Vail visit, they stop in the middle of Main Street in awe of the surrounding jagged peaks that seem just a little closer, higher and less attainable. Even the oldest Telluride locals saturate their Facebook pages with weekly pictures of the valley floor and surrounding San Juans. Apparently, beauty in Telluride never gets old. 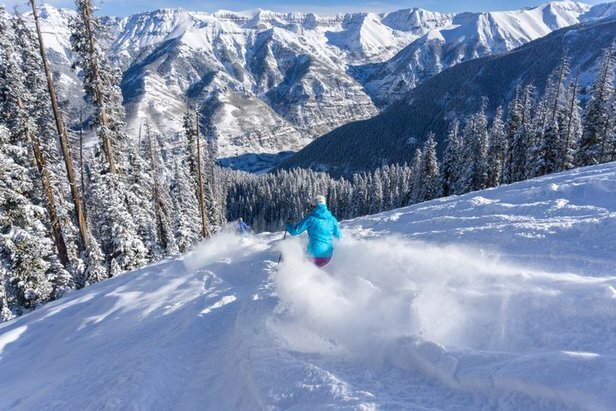 All of Colorado’s ski resorts boast black diamond terrain, but the ridge off of Telluride Ski Resort’s Prospect Lift leading to the runs of Black Iron Bowl with local favorites like Mountain Quail, Westlake and Diehedral face. Turn up the adrenaline and continue further to Palmyra Peak, which takes in-bounds extreme terrain to a whole new level. The hike itself self selects the real expert skier from the poser, and the lines available turn that skier into an artist and an innovator. The hike-to terrain offers accessible fresh tracks and ballsy lines for the fearless skier, long after the last storm. 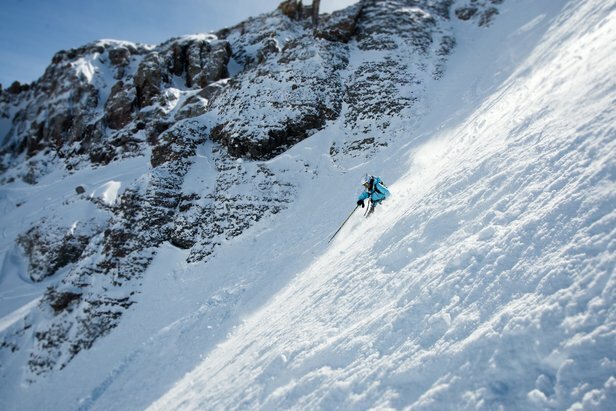 Telluride’s Black Iron Bowl and Palmyra Peak off an inbounds backcountry experience. In Telluride, a snowstorm is a reason to celebrate, and the powder line is more like the receiving line at a wedding than an inconvenience. At around 8:30 a.m., people slowly migrate toward Lift 8, riding bikes with studded tires while balancing a latte in one hand and skis and poles over the opposite shoulder. As they form a haphazard powder line, they trade text messages from ski patrol friends regarding estimated times for the end of avalanche control work and the opening of various upper mountain lifts. They hoot and holler as the first chair loads, and within 15 minutes, the line at the bottom vanishes without a trace. The most stressful part of the day is deciding to go for freshies off Lift 9’s Locals Loop-Kan’t Mak’ M to Spiral Stairs to Lower Plunge—or to head to Gold Hill for some white gold. There are few destinations that place equal value on the experiences endemic to the area’s most exquisite and exclusive wine bar and those at the town’s soulful dive bar. Allow me to introduce you to Alpino Vino, an Alps-inspired, ski-in/ski-out chalet perched atop the ski area at 12,000 feet with 360-degree undisturbed views of pristine mountain ranges serving exquisite wines and beers, platters of artisan cheeses and sandwiches. Let me also introduce you to The Last Dollar Saloon, endearingly known as The Buck, a good ol’ small town bar that boasts inexpensive tap pours of Pabst Blue Ribbon, steamy windows, a juke box, pool table and a bunch of bearded ski bums dressed in the same black down jacket. Cheers and welcome to Telluride! 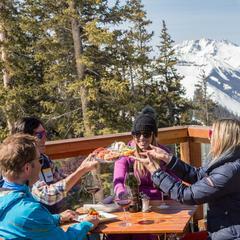 Alpino Vino is the highest restaurant in North America and serves up a bounty as delectable as the views. What Telluride lacks in size, it makes up for in heart and soul, which is grounded in its off-camber main street lined by coffee shops like the Phoenix Bean and Ghost Town. Grab a cup of joe and stroll down main street to check out the independently owned shops and boutiques. Scarpe, Two Skirts, Down to Earth and Sublime serve up a nice dose of function and fashion. When it's time to refuel, stop by the Butcher and the Baker, Taco Del Gnar or La Cocina. 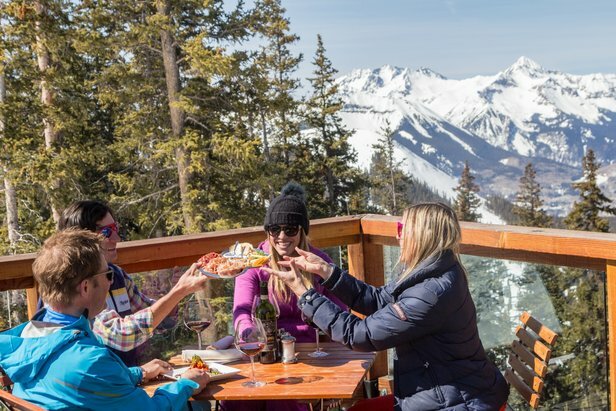 No day is complete without après ski, so enjoy a beer under the umbrella at Tomboy Tavern, a craft cocktail at Black Iron Kitchen or some hearty nachos and libations at Oak. Here, you'll see more bikes than cars parked at the chairlift and that lift lines are the exception rather than the rule. You'll see that skis are stashed in office closets rather than sport coats, and meetings are over powder instead of martinis. You’ll slow when you walk down main street, discovering that you’re no longer in a hurry but instead focused on the mountains around you whose beauty always seems to change. There are no chain stores or fast food restaurants in Telluride; the nearest stoplight is 45 miles away. The greatest thing about Telluride is that it doesn’t make a whole lot of sense. It’s a beautiful ski town dripping in culture that makes its own rules. It’s a take it or leave it sort of place, but those looking for the real deal when it comes to the genuine ski town experience always elect to take it—and then end up coming back for more. 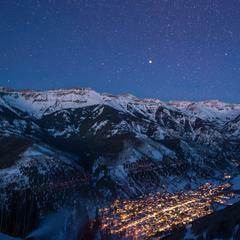 Start planning your ski trip to Telluride here or call (855) 350-2454.